Just some feedback for you regarding usage of Kate on Windows 10. I have been a user of the context editor for years now, http://www.contexteditor.org as it has all that I need from an advanced text editor. However, the development of this fine tool stopped a while back and it was not released as open source. Basically it is dead in the water but still thoroughly usable. I rely on it as it is configurable and does the job very, very well. Knowing though that I do have to migrate to a supported tool I have been regularly testing the various and numerous text editors that are available on Windows and none have met my peculiar and specific needs. In some way they have all fallen short in usability. I picked up Kate with no expectations and not being a linux user I have had no experience of it in the past. I find it to be configurable, extensible, adaptable and above all useful. I found Kate due to having a desire to run the KDE desktop including Plasma on Windows so I could take advantage of KDE's widgets, specifically the steampunk timekeeper widget for which I was responsible for the graphic design. I create widgets for Windows and I was most interested to see that I could potentially run plasma widgets on KDE on Windows. There is potential there. I saw that the attempt to port KDE wholesale has been largely abandoned but found on that web-page a list of KDE apps that now run on Windows. I found Kate that way. Thankyou for such a useful advanced text editor and thankyou for taking the time to port it to Windows. I shall do my bit to raise awareness about the editor and how useful it is on a multi-platform basis. My next desire would be to get Kdevelop up and running so that I can use it as my default IDE. Some time before that will come to fruition I suppose. Kate is good enough for me at the moment. I eventually stopped using Kate as my default editor though it is still installed, I intend to use it in the future when it has some of the functionality of other editors. The reasons I abandoned it (temporarily I hope) were largely the search and replace functionality. It really wasn't up to the level of the rest of the editor. It is stuck at the bottom of the window in the least useful location. I run Kate windowed and the bottom of the window is always off screen. Anything placed at the bottom of the screen is in the least-useful position so it is reserved for the least useful functions. Search is not one of those. Searches should have the option of appearing as a traditional pop up instead of bottom-feeding. 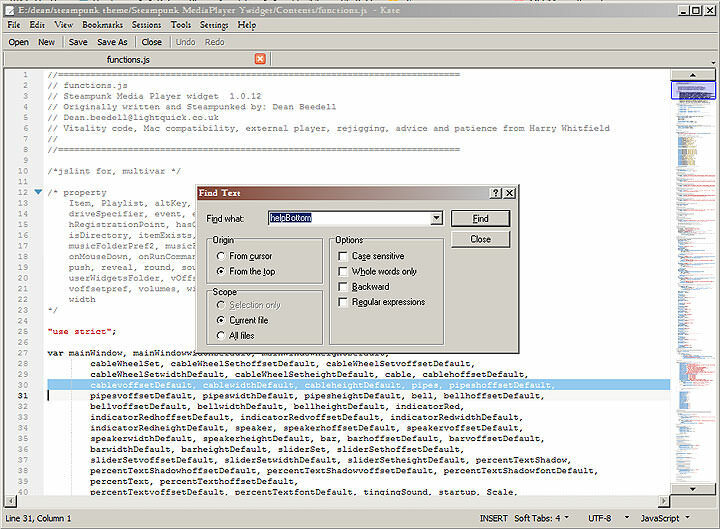 Example mock-up of a pop-up search window in Kate. I have other problems with search and replace and context switching, separate tabs for each, failing to remember history &c but I'll raise those in a separate post about search and replace. My other reasons for not using Kate are minor, I like to have a fully configurable editor that allows me to switch in things like rulers and one that has the ability to select a line of code on a single click. These are minor. The search is the killer for me. I like Kate, I could grow to love Kate but until the search is configurable as a pop-up then it is not my editor of choice. A sterling effort though. Back to my search for the perfect editor... I thought I'd found it.